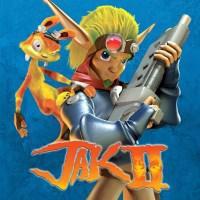 A direct sequel to Jak and Daxter: The Precursor Legacy that is a radical departure in tone, difficulty, and structure. While it does still have a strong sense of humor, it’s much darker than its predecessor, replacing the bucolic setting of the first game with a techno-dystopian walled city and opening with Jak being subject to torturous experiments for two years that leave him with a superpowered “Dark Jak” side. It’s also a great deal more difficult, both because the player is tasked with much more challenging objectives and because the structure has changed such that the player can no longer pick and choose which objectives to complete. The Super Mario 64 -like hub-and-spokes framework has been discarded in favor of an open-world mission progression of the sort popularized by Grand Theft Auto III . Sometimes you’ll have multiple plot threads open simultaneously and you can choose which mission chain to tackle first, but you still have to complete all the missions in order to advance the story. The player thus has less freedom, but this also means that the story can be more complex and better integrated with the gameplay, and correspondingly there are far more dialog scenes and more characters who matter to the plot. The combined result of these changes is that Jak II is less kid-or-newbie-friendly than the first game and thus has a smaller target audience. But for those within that audience, this is a well-crafted experience that mechanically expands on The Precursor Legacy in enjoyable ways. Jak retains the high mobility of his full moveset but also gets a hoverboard that’s shockingly satisfying to use (and topped my list of video-game-gadgets-I’d-want-in-real-life until Portal ). Hoverbikes are back, but with better control and more variety, including ones with combat capability and ones designed for racing. Combat has been completely changed by giving Jak a gun with a handful of different firing modes as well as the aforementioned “Dark Jak” mode that takes away the gun but improves his melee abilities. These additions and expansions allow the gameplay to focus on variety even more than before. The hoverboarding, the driving, and the combat can finally hold their own alongside the platforming. Missions liberally mix and match these play modes - plus one-shot mechanics or minigames - into enough combinations of challenges that every mission feels different yet somehow keeps the polish level high all around. If you can stomach the much darker tone and the much higher difficulty (I’m fairly confident Jak II ’s final boss is the hardest boss fight I’ve ever won), there’s a lot to enjoy here. Personally, it was my favorite game out of the entire PS2 library. Be warned that in the original PS2 version, there’s an issue known as the “stadium bug” that can ruin your save file if you perform certain actions in an unusual order. See this FAQ for details. This bug was fixed for the PS3/Vita version. I have yet to see confirmation as to whether it is also fixed in the PS4 version. I Stopped Playing When: I completed the game multiple times on PS2 and then again on PS3.